This activity was a little more difficult than we expected (I don’t know why I didn’t expect it to be hard- we’re talking about sexual activity after all!). It was hard for us to explain each of the sexual activities. Part of the point of this activity is to talk about the variety of sexual activities, but sometimes we get caught on our own hang ups and assumptions about what people need to know. On the other hand, this material was difficult and new for many of the participants in the group. Talking about sexual activities can make people feel uncomfortable. I think, in the end we struck a nice balance between expressing the diversity of sexual expression and having opportunities to set personal boundaries. I would make some revisions to the lesson plan and those revisions are reflected in the lesson. We did a mini pretest which we revisited at the end. The bulk of our activity involved sorting sexual activities into categories and talking about the continuum of intimacy. The relationship categories really helped set up the continuum so I would recommend doing that step first (the relationship categories aren’t listed in order. 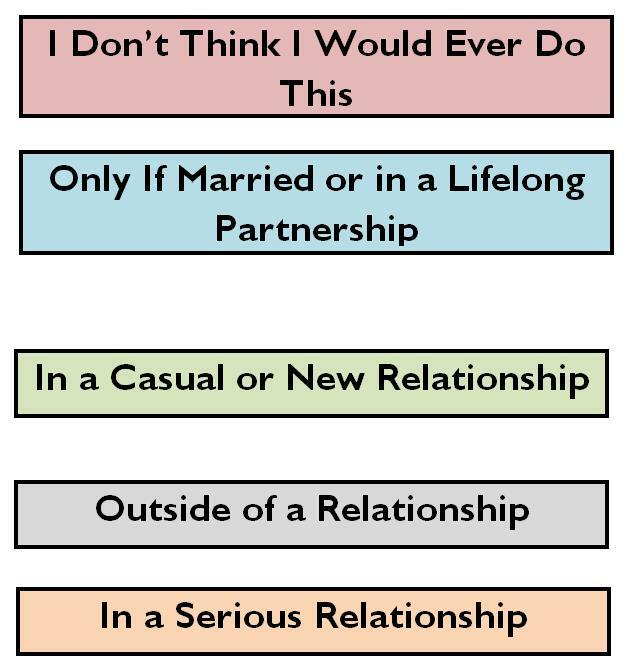 I would do it from left to right- outside a relationship, in a casual relationship, in a serious relationship, only if married or in a lifelong partnership, and I don’t think I would ever do this). I would then move into talking about how these activities have a continuum. I changed the picture a little to better represent the continuum concept. We then talked about the human sexual response cycle. As we were talking we used the sexual activities to help make the sexual response cycle more concrete. We ended with revisiting the pretest questions and talking about our own values. Most of our group really values the emotional components of relationships. If you’re teaching human sexuality and would like to use these materials, go for it.